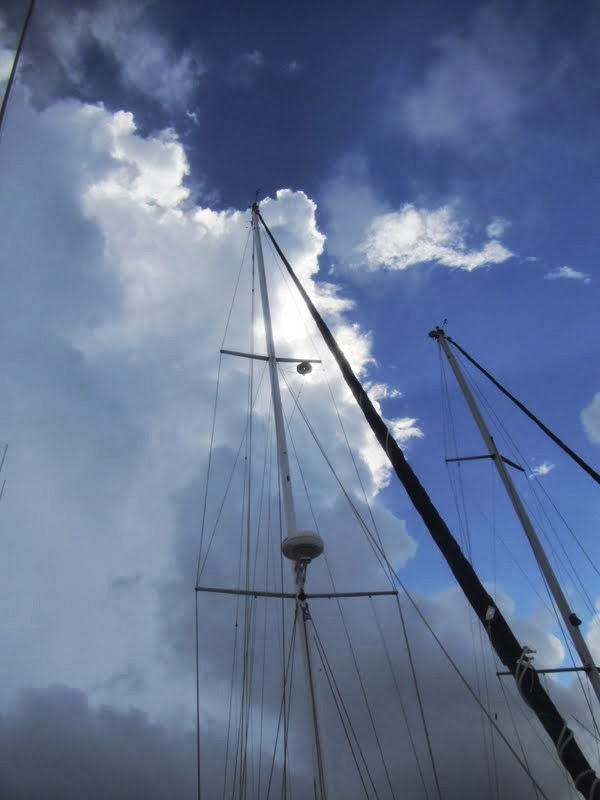 We used a halyard to lift the dinghy from the water to the dock. The dinghy that came with Dos Libras was much better than the one we had before. It has a rigid bottom and we LOVE it! It has, however, seen better days as her many patches will show... For a Cruiser, the dinghy is the equivalent of a CAR. Cruisers often need to travel miles in their dinghy so it is necessary to have one that will stand up to daily use. We found a few more leaks to patch before we could apply the Topcoat. We have patched our dinghy many times and it seems that there are still those little niggling air leaks and some pretty heft rub marks, that had me thinking it might be time to consider a new dinghy. Before we went to that extreme... (dinghies are pretty pricey) I did some research online and found out that you can resurface a Hypalon dinghy using a kind of rubber paint. I was up for spending a few bucks now in an effort to prolonging her life for (hopefully) a couple more years. I spent half a morning making sure the surface was clean. I turned to Practical Sailor for advice and found their review just as I was about to make a huge mistake. We bought West Marines's brand of Hypalon paint back in April, and before we got around to using it, I read the reviews! Thankfully, West Marine took the product back so we weren't out the money we spent. 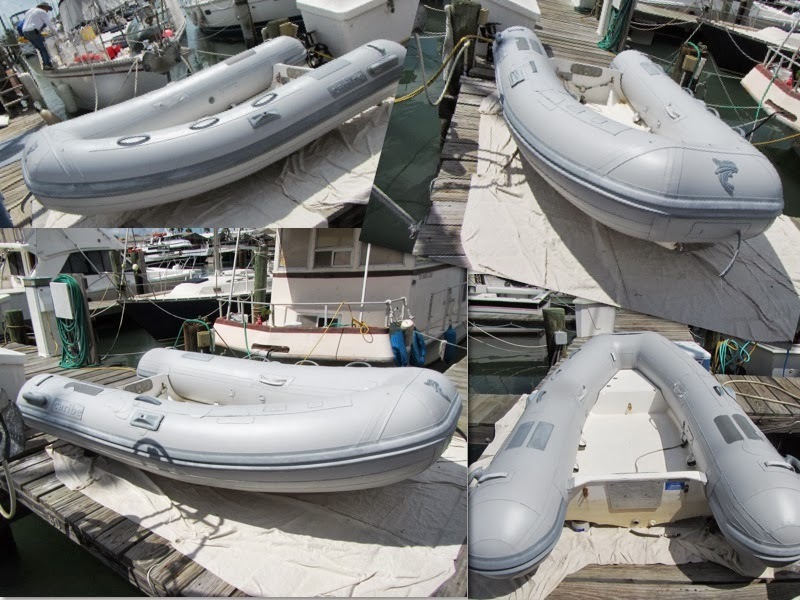 We ordered the product touted as a Practical Sailor's "Best Bet", MDR Amazon's Inflatable Boat Top Coating. The article in PS said that the product is non-toxic and odor free. It is also water based so application and cleanup is a breeze. We also bought the product recommended as a preparatory cleaner from MDR, the Inflatable Boat Cleaner. We know that adequate prep can mean the difference between success and failure, so we wanted to give this product every chance for success. Let me say here that I'm a total skeptic when it comes to believing the claims advertised about products in general, and this case was no different. The Cleaner was supposed to be "spray on and wipe off" easy and the Topcoat was supposed to cover an entire boat for two coats (about 100 sq. ft.). I wasn't really believing either claim... but I was wrong! The cleaner was truly a miracle! It got years of oxidation and grime to just fall right off in the rinse. We did have to scrub a few spots with a cloth, but they were pretty bad and we didn't scrub long. I couldn't recommend this product any more highly than I do. We lifted the dinghy onto the dock on Day 1. We went to work washing the surfaces and found that there were some new air leaks that needed attention before we could do the resurfacing. We patched the holes and waited the appropriate drying time, which took us to Day 2. We got an early start with another quick wipedown to remove anything that might have accumulated on the surface of the tubes overnight. We taped the top of the rub rail and the little dolphin on the front, figuring I could go around all of the other non-painted surfaces freehand. I got the entire topsides done and front and one bottomside done before taking a break. I could barely go on and realized that we had forgotten breakfast! No wonder I was about to pass out! We left the dink resting on the unpainted bottom tube and spent the hottest part of the day huddled down below in the AC. I painted into the setting sun... in a dress. When I was done, we stood back and admired the new look. It looks GREAT! I had been so worried that it would turn out looking terrible, that the paint would be goppy or that there wouldn't be enough to cover the whole dinghy... But there was plenty of paint left for a second coat. It had gone on so easily and drips wiped up with a damp cloth. I will admit that my freehand painting has left some paint encroaching onto the lower rub rail, but that's the price you pay for doing a job yourself... you accept a certain level of imperfection. Look Ma! Your seats await! We were invited onto the veranda by our feline babies, where we happily retired to have a beverage and shop for a new dinghy cover online. Fashion goes out the window when its HOT! Day 3 - We have a second coat to apply. I was out all the more early, having learned my lesson the previous day... I wanted to take every advantage of whatever cool temps the morning could provide. There was even less wind today, total calm... I began to drip right away. The second coat went on much more quickly than the first. I had spent some time in the night worrying about how the blue tape would stick to the rubber paint, but I worried needlessly. The paint was stuck to the boat, not the tape! 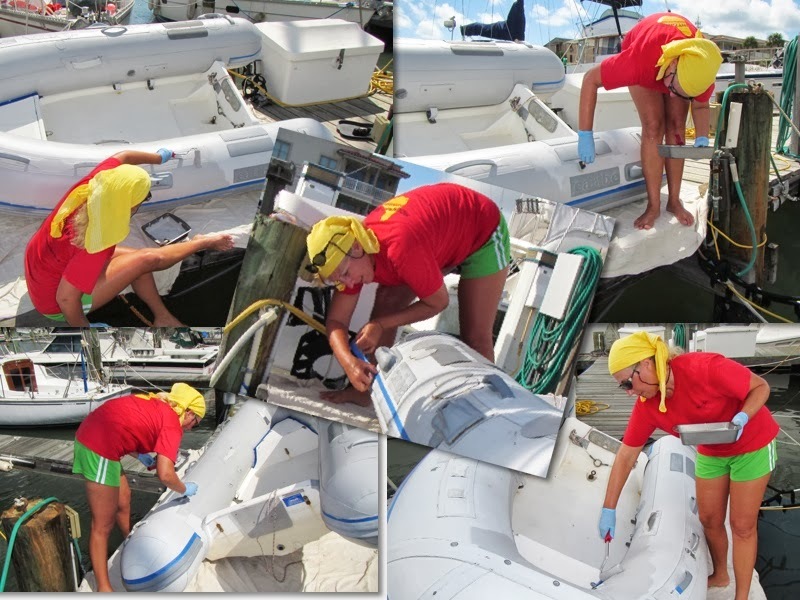 I made my way around the dinghy quickly, opting to do the topsides first, then go back around to do the areas just below the rub rail, in case we ran out of paint. Again, no worries... we had plenty. After I was finished, we once again stood back and admired the work. It looked even better than the first coat! It smoothed out better, you could see fewer brush strokes... We are THRILLED! I looked up to see THIS! The sun was disappearing behind a huge cloud with it's bottom falling out! Sure we need the rain... but why NOW? Luckily, the summer shower passed over quickly, leaving only a smattering of droplets for us to contend with... All of my backbreaking labor was safe. would be, to do it in OCTOBER! Good luck on your dinghy project! Thanks! We've been cruising now for over two years and the dinghy has done well. We are thinking of applying another coat of paint and need to replace a fill but otherwise, it's added years to our dinghy! Thanks for your comment, it's nice to know that we are reaching people! Excellent review of this product. How did it stand up as I am thinking of going down this path as well. Also, what is the best way to find leaks in the Hypalon? Don I would not hesitate to recommend this dinghy paint to everyone. We have been very pleased with its performance. It has never peeled or cracked and still looks great. I will say that it has worn or been scraped off in spots but even so has not peeled. It looks really like the original coating unless you look very closely and know it is there. To find the leaks, we use a spray bottle with water and some dish soap. Fill the tubes and spray the soap mixture. It will make bubbles where the holes are. We purchased sealant for the inside of the tubes but have never used it. We are working on the dinghy today and may try to put the inside sealant into one of the tubes. Thanks for reading and for your post! You may find it more easy to reach us on our Facebook page, S/V Dos Libras!